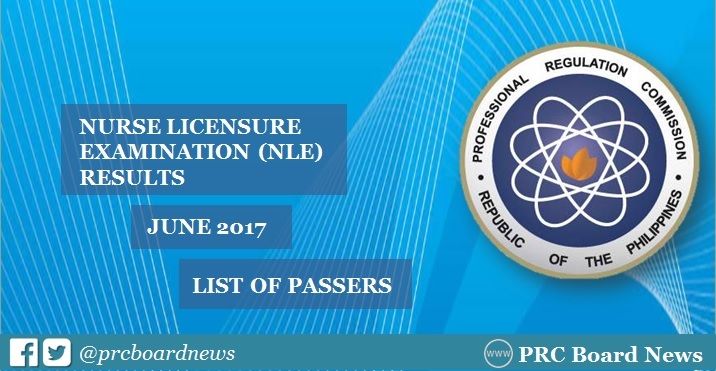 MANILA, Philippines - (Updated June 16) The Professional Regulation Commission (PRC) and the Board of Nursing (BoN) officially released results of June 4 and 5, 2017 Nurse Licensure Examination (NLE) also known as nursing board exam on Friday, June 16 or in 8 working days after the test. The June 2017 NLE results - complete list of passers, top 10 (topnotchers), top performing schools and performance of schools are available on this page. UPDATE: 3,882 out of 11,176 (34.74%) passed June 2017 nursing board exam, the lowest passing rate since 2014. PRC administered the NLE in several testing locations nationwide: Manila, Baguio, Cagayan De Oro, Cebu, Davao, Iloilo, Legazpi, Lucena, Pagadian, Tacloban, Tuguegarao and Zamboanga. The members of the Board of Nursing who gave the licensure examination are Gloria B. Arcos, Carmelita C. Divinagracia, Carfredda P. Dumlao, Glenda S. Arquiza, Florence C. Cawaon and Cora A. Anonuevo, Members. The June 2017 nursing board exam has drawn basic knowledge, skills and attitudes in the major subject areas i.e. Fundamentals of Nursing including Professional Adjustments, Maternal and Child Nursing, Community Health and Communicable Disease Nursing, Nursing of Adolescents, adults and aged and Mental Health and Psychiatric Nursing. NLE is composed of five (5) parts namely: Nursing Practice I (Basic Foundation of Nursing and Professional Nursing Practice), Nursing Practice II (Community Health Nursing and Care of the Mother and Child), Nursing Practice III (Care of Clients with Physiologic and Psychological Alternations - Part A), Nursing Practice IV (Care of Clients with Physiologic and Psychological Alternations - Part B) and Nursing Practice V (Care of Clients with Physiologic and Psychological Alternations - Part C). Based on PRC Resolution No. 2016-1019, the target date of release of NLE results is on Friday, June 23, 2017. This falls on 18 calendar days or in just 13 working days after the last day of exam. The computed number of working days excludes weekends and public holiday on June 12 or Independence Day. In June 2016 board exam, results were released in just 9 working days. A total of 6,183 out of 14,184 (43.59%) passed the exam. In May 2015, results were out in 16 days after the exam. A total of 9,707 out of 17,891 successfully hurdled the exam. UPDATE: The Summit Express and PRC Board News advise takers to monitor results starting Saturday, June 17 until the 23rd or within 8-13 working days. Reliable source hints that judgement day is coming very soon. PRC Board News will update this page once we got reliable information from our sources. In the previous board exams, takers can expect exact release date of results by always visiting this site. In June 2016 nursing board exams, West Visayas State University (WVSU)- La Paz, Bicol University - Legazpi, Far Eastern University (FEU) - Manila and Ateneo de Zamboanga were recognized as the top performing schools per Commission Resolution No. 2010-547 series of 2010. WVSU garnered 100-percent passing rate. In May 2015 exam, Chinese General Hospital Colleges, Silliman University and WVSU-La Paz were the top performing schools for having 100 percent passing percentage. All takers may check their ratings online in few days after the release of results. It will be activated on this page. Enter the required information in the appropriate fields to verify your identity.